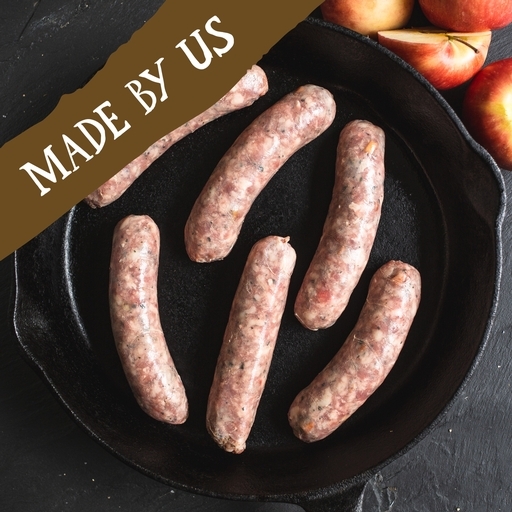 Apple adds a hint of fruity sweetness to these fresh pork sausages, prepared in our own butchery. Three things make our bangers brilliant: first, we use prime quality organic meat. Second, we don’t over-manufacture, so they stay coarse and meaty. Finally, natural casings enhance the flavour. Gluten free and simply seasoned, these are great for the whole family. Oil lightly and fry or grill on a medium heat for 10-12 mins until completely cooked through to the middle, turning frequently so that they colour evenly. Alternatively, cook them in an oven preheated to 180˚C/Gas 4 for 20 mins, turning halfway through.